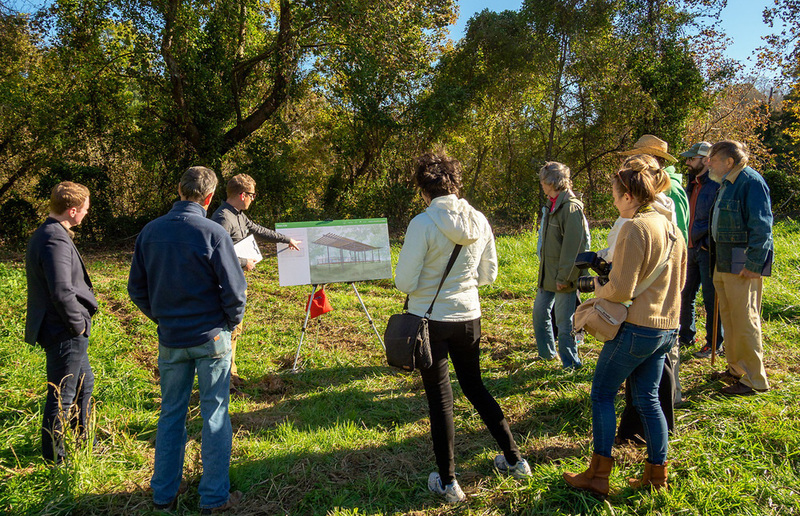 Samsel Architects spent our summer working on plans for RiverLink’s Karen Cragnolin Park, and last week, we were happy to be able to present the Draft Master Plan to the public during guided tours of the property. We have been working alongside a great design team led by Nelson Byrd Woltz Landscape Architects along with local firms, Equinox Environmental and Anchor QEA. For our part of the project, we have designed two structures to be integrated into the park. The first, The Pavilion, a covered walkway that will extend out of the landscape, overlooking the water that also serves as an outdoor classroom. The other, dubbed The Trellis, is a curved and trellised structure that surrounds a lawn and has concrete tables and benches. Images Courtesy Slow Glass Pictures. The site of the future park is located behind a chain-link fence on Amboy Road and butts up to the French Broad River. 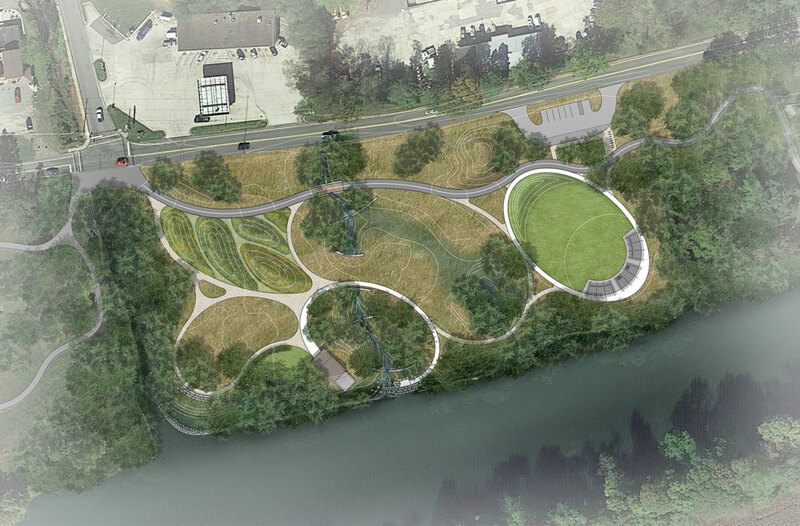 This 5.3-acre lot has been dubbed the “missing link” in a chain of riverfront parks. 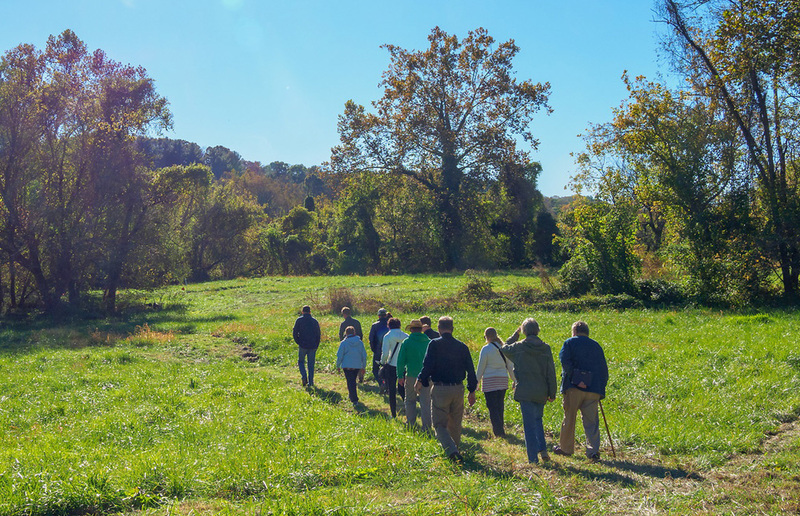 When open, the park will finally connect French Broad River Park to Carrier Park, something many Asheville residents have been waiting for. The lot used to be the site of a junkyard in operation for many years, covering the land in scrap metal, concrete and soaking the ground with volatile compounds. When RiverLink was able to purchase the property in 2010, they began a years-long soil remediation process. 100,000 tons of concrete was removed and phytoremediation was utilized to clean contaminants from the earth. A final draft of the plan goes before the RiverLink Board of Directors in December for a vote. Below are renderings from Nelson Byrd Woltz that show what the park will look like when finished. Renderings Nelson Byrd Woltz Landscape Architects.